In the summer of 2016, the Ed Tech Committee vetted several learning management systems (LMS), and Schoology was eventually adopted for its ease of use, integration with Google Drive, and interactive affordances (e.g., video responses in discussions, Media Album for sharing student projects and obtaining peer feedback, and app center). Since then, the Library and Instructional Resource Services have been training faculty, staff, and students. There are the 10 master trainers on campus: Dwight, Maura, Bret, Lauren J., Terry, Daniel, Royce, Allyn, April, and Sandra. Feel free to reach out to these Schoology master trainers for assistance. For faculty, we provide complete LMS training with the 2-and-a-half hour Schoology 101: The Basics workshop. If you only need to use Schoology as a repository and/or basic communication, then come to the first hour of Basic training. This Basic training is provided to new faculty during orientation. We added 45-minute specific tool training workshops (e.g., Assessments, Gradebook, Portfolios & Rubrics). For students, we trained a cohort of student LEAP Leaders, who in turn train all incoming Freshmen. We also introduce incoming Freshmen to Schoology at BadgerConnection. If you already received training and haven't provided us with an evaluation, please take a moment to do so here. Dr. Rogers (srogers@shc.edu) developed a hybrid course demonstration site on Schoology. She also developed a fully online self-paced workshop on how to make your online course more accessible. Contact her to be added to either of these. Instructors developing courses for distance education are enrolled in the Online Course Design Project group on Schoology and have access to all available resources and supporting documentation for teaching online at SHC. For example, see the Online Course Design Guide attached below. For instructors web-enhancing their traditional brick-and-mortar classes, the SHC Schoology page has all of the same resources available. See the Distance Education tab for research best practices and ways to incorporate Ignatian pedagogy in your online courses. Spring Hill College (SHC) purchased a campus-wide license for the Respondus software. It’s a Windows application that helps you upload your tests or surveys or your textbook publisher's test bank to your online courses. This will save you from having to create tests questions one-by-one in Schoology. Download the software on your computer (PC only) or use it on the computer workstations in BL112. Locate the software and password for installation on the Schoology SHC page in the folder titled, Test Migration Software. If you have any questions, contact Dr. Rogers (srogers@shc.edu) for support. She created a video tutorial of the entire process of using Respondus for test migration from where to find the software to installation to formatting your tests for upload to Respondus and then migrating it to Schoology. It's titled Respondus Video Tutorial for Migrating Tests into Schoology. Use this Respondus workaround to transfer your paper-based quizzes into Schoology. 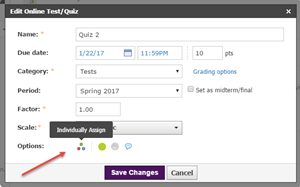 You can also transfer your quizzes from other learning management systems (e.g., eCollege, Blackboard, D2L) into Schoology. Watch this video tutorial on how to migrate tests from eCollege to Respondus and then upload to Schoology. Learn how to use the Respondus Test Bank Network to transfer your textbook publisher's tests into Schoology courses. Note. The alternative to Respondus, albeit basic, is the Blackboard Test Generator. See more information listed below. Create a blank test in Schoology. From the drop-down menu, select Import Test/Quiz. Select Blackboard 7.1-9.0 button for import type. Locate your bbquiz zip file for import from your computer. Then you'll need to provide test settings. This guide provides instructions on how to use this open educational resource to convert your paper test into a Bb file for upload to Schoology. Log in to your SHC Gmail. Open a new tab and go to https://shc.schoology.com/. This will take you to your SHC Gmail for login again. Log in to Schoology with your school Gmail login credentials. Select your class from the Courses tab drop-down menu. Select your group from the Groups tab drop-down menu. Log out by selecting it in the drop-down menu (Logout) near your name in the upper-right-hand corner. * Note: University of South Alabama students do the same and log in with the SHC Gmail credentials. Select your name to add your photo and info. Hover over the default image to edit. The drop-down menu beside your name will allow you to set your Notifications, Account Settings, and Privacy. Select the question mark (?) in the top right corner to access the Schoology Support Center tutorials. Contact the Spring Hill College (SHC) HelpDesk@shc.edu to open a ticket for technical issues in the course. For all regular registration issues, contact the Registrar’s Office at registrar@shc.edu. It will take up to 24-hours for your course(s) to populate in your Schoology account after registration. Access your SHC Google Drive in Schoology when submitting assignments and posting discussions. Be careful when deleting documents from Google Drive from within Schoology, as this will delete it from your actual Drive account. It can be retrieved from your Google Drive trash bin. Go to the Resources tab and select Apps from the drop-down menu. Select Google Drive, YouTube, and others of interest. This guide is for SHC and USA students to use to help them log in to the learning management system and learn basic user information. Some instructors use these test integrity software programs. They'll inform you prior to your test if it's required. The Respondus Lockdown Browser is covered by the College. For the Monitor, there's a $10 student fee. See the guide to learn how it works. Students will pay a $10 fee per course (not per test) that uses the Respondus Monitor for test security. This is a shared fee structure with the College. For example, the use of Respondus Lockdown Browser is paid for by the College. View this video to earn what these tools do and why they are important for test integrity. These are Dr. Rogers' notes from her workshop on the Schoology Gradebook features and best practices. Schoology is updating its policy regarding supported mobile operating systems (OS) to include only the last three versions. If you use the Schoology app with an iPad, iPhone, or Android device, make sure that you're running one of the newest versions of the OS. Keep the Schoology app up-to-date, as well. As a general rule of thumb, check for updates before every academic term. This ensures the smoothest operation and a better experience so you can enjoy updated features and avoid software hiccups during critical events such as testing. Click here for instructions on updating the Apple iOS. Click here to learn how to update the Android OS. This how-to guide was produced by Schoology. This guide describes how to access old courses in Archives or current ones to copy into a new blank shell. It also advises you to copy your Gradebook settings first, so the material will be in sync with it. This document was created with the instructions from the Schoology Help Center on using their portfolio tool. This guide was developed by the Librarian, Lauren Jensen, and the instructional designer, Sandra Rogers. For copyright compliance, share articles directly from the database source with the EzProxy link. Do this for every professional article you share; don't post PDFs directly in the online course. The Respondus LockDown (LDB) Browser is for test security during a proctored exam. For unproctored exams, we encourage the use of Respondus Monitor in addition to the LDB. See the specific link for instructors to prepare an exam on Schoology. Also, there's a link to a student overview on this page. This link provides video tutorials, guides, and dates for upcoming webinars. Dwight Spivey can add your departmental student learning outcomes (SLOs) from an Excel sheet to the Schoology system for use in course assignments. After they’ve been added to the system, when you create an assignment (or in edit view), select the bull’s eye target icon for Align Learning Objectives. Then select the Custom Learning Objectives to find your departmental ones under the School heading. Schoology's App Center offers numerous software applications (apps) that meet learning tools interoperability (LTI) standards. This means that the apps offered will seamlessly integrate within your Schoology course as a standalone component. Benefits include single sign-on and the integration with the Schoology Gradebook. View the list available in the App Center on the Schoology Homepage. For example, if you use Cengage learning products, they have the Cengage LMS Integration app. Perhaps you'd like to reuse open educational resources (OER) in your course. If so, Schoology's App Center offers the OER Commons and MERLOT resources that you can integrate into your courses, as they have share licensing. For these, you need to create an account with the third party (e.g., MERLOT or Cengage Learning) and obtain an access key. Contact Dwight Spivey (x3878) for more information. Use this Schoology guide to bring external tool material into your courses. Make sure to ask Dwight Spivey to turn the external tool on at the system level for your class use.